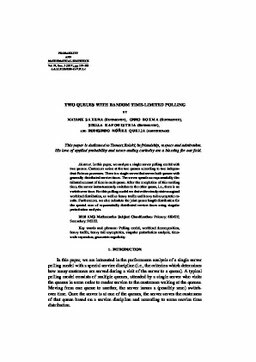 In this paper, we analyse a single server polling model with two queues. Customers arrive at the two queues according to two independent Poisson processes. There is a single server that serves both queues with generally distributed service times. The server spends an exponentially distributed amount of time in each queue. After the completion of this residing time, the server instantaneously switches to the other queue, i.e., there is no switch-over time. For this polling model we derive the steady-state marginal workload distribution, as well as heavy traffic and heavy tail asymptotic results. Furthermore, we also calculate the joint queue length distribution for the special case of exponentially distributed service times using singular perturbation analysis.